Diane von Furstenberg will forever be known as the designer who brought women the figure-flattering wrap dress nearly four decades ago. This weekend she presented her spring 2013 collection at New York Fashion Week. Not only did she show a beautiful collection for next season but she also introduced fashion's finest to Google Glass, the latest hi-tech glasses that Google has introduced. Models wore them while strutting down the runway. Even the designer herself came out wearing a pair with orange detailing at the end of the show. Even though the glasses have been dubbed as looking geeky, they are being hailed as the next thing. Google co-founder Sergey Brin made an appearance on the runway with von Furstenberg. She pulled him out of the audience to join her in the finale. He told the Hindustan Times, "Beauty, style and comfort are as important to Glass as the latest technology. We are delighted to bring Glass to the runway together with DVF." You might be asking what exactly is Google Glass anyway? It's a product that Google is still developing and plans to have on the market by 2014. Worn like glasses, they have functions very similar to smart-phones. With only a piece of glass over the right eye, they have the ability to take photos, check calendars, record video and much more. Each pair worn on the runway was designed to match the colors in the model's outfits. Some models even turned on the device to record footage during the show. 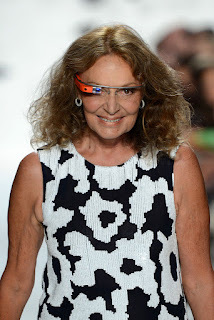 DVF plans to release the video as a short film on Google+ this week. As innovative as the new product is, it didn't take away from the collection DVF presented for next season. It dubbed with the name 'Palazzo'; the color palette of brights like blue, coral, yellow and green were both confident and full of life. A mixture of caftans, draped dresses and layering, the clothing was soft and fluid with layers framing a woman's figure.